There are two types of auction nowadays, online and offline and used to best advantage and by having a keen eye, you can use both of these to better your finances. and buy at the local auction to sell online. auction for £5 and got over £70 from them on ebay. I didn't lie, I just said I didn't know anything about radios, didn't know if they worked properly, wrote down all the numbers and logos on them, took a photo of the backs and fronts and that was it. Sure it was a bind having to parcel them up, but it was quite easy money. I haven't always been that successful, but it's an example of how it can work. You can also try boot fairs and charity shops to buy of course and you shouldn't have a guilty conscience should you pick up a bargain, they are the ones setting the price, not you. Even then, you may not sell anyway. The thing is with this is that because of TV, a lot of people are doing the same as you, so you have to look especially hard for the proper stuff. Try looking for the niche and collectable. Lots of people go for toys, but unless they're pretty pristine and in the box, they're just a few pence. Go through every single section of ebay and look for the items which have the least amount of pages selling things which appear to be sought after. If you are registered click on the 'sold items' and that'll show you the last months sales of everything in that section. Once you've made a list of things you may make money on, go to the Boot Fairs, shops and local auctions and have a good time. Don't get 'auction fever' or your garden shed will be full of useless junk until you yourself have a boot fair and throw it in the skip at the end because you don't want to take it home with you. 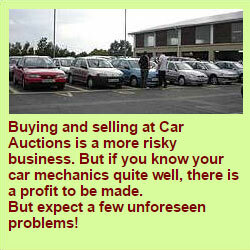 Online auctions can be used for selling your own surplus of course. You must look around your house and garden and say 'do I need it, will I need it, is it worth anything'. It could be worth something to someone ! Somebody gave me a load of old windows which were dumped in my lean to for 2 years. In desperation I put a 'buy it now' ad into ebay for £10, must collect and it sold in hour and was out the way the following day ! Everyone has a story to tell ! Online auctions have seriously affected Boot Fairs and Charity Shops plus Designer Outlets now sell clothes for less than second hand stuff, so the Charity Shops are suffering and looking more toward new stuff than someone's chuck outs. With Boot Fairs it's good always to look like the inexperienced family having a clear out. Fairs are becoming overloaded with big vans full of Cash and Carry stuff and house clearance items. If you go to a Boot Fair early enough, you'll see the bargain hunters almost following the car to it's site and looking inside the boot before you've stopped ! So mix anything you may have brought for resale in with the Pushchair and old toys etc. Don't look 'the trader'. Personally I gave up doing Boot Fairs, I could earn a bit of money but it was pot luck on the weather and you'd usually sold the main items by 9am anyway and spent the next 4 hours doing nothing. I found I could earn a bit of extra cash more by staying at home and selling online thus being more choosy about the things I was buying and selling. A few things I've brought which I slipped up on are; mirrors, pictures, books and chinaware. I've done well with retro chinaware, niche ornaments (pig, chicken, goat etc), old radios (I've since brought another 6 and thrice fold my profit), railway stuff and old PC bits. Think of the effort of post and packing though, get 100% good feedback by not hiding anything from prospective buyers and not charging them over the top on postage. If having a Boot Fair, treat it as a Shop, price items as people are often shy to ask a price. When buying have lots of change with you - "60p Mate?"